The new bipartisan proposal for immigration reform has rather impressively unified every political figure who isn't named George W. Bush, John McCain or Ted Kennedy in opposition. Personally, I have no problem with the deal -- it seems as fair as it does ineffective. Although I'm also of the school that the only way we can solve our illegal immigration "problem" is either somehow elevating Mexico's economy to first world status or nuking the Central American nation. And until one of those options is feasible, we should just eat our reasonably priced oranges and like it. But John McCain, clearly more passionate about defending the measure than I would be, resorted to angrily using the worst four-letter word there is when debating the merits of the proposal with fellow border-state law-maker John Cornyn (R-Texas) in a Senate meeting room last Thursday. 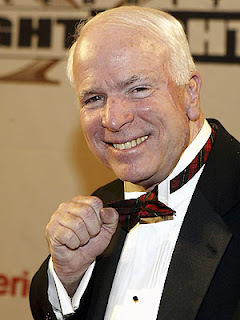 According to witnesses, McCain also used another curse word "associated with chickens" during his tirade. "Maybe his (Romney's) solution will be to get out his small varmint gun and chase those Guatemalans off his yard." Well played, septuagenarian. It's funny because it's true. And it is also the snark one would expect not from an aged red state Senator, but from a hip cynic with the kind of youthful demographics advertisers love. Come to think if it, now that I know he has this weapon in his arsenal, maybe it wouldn't be such a bad idea if McCain responded with the regenerative power of facetious vitriol every time someone brings up facial blotches or naps on the Senate floor.